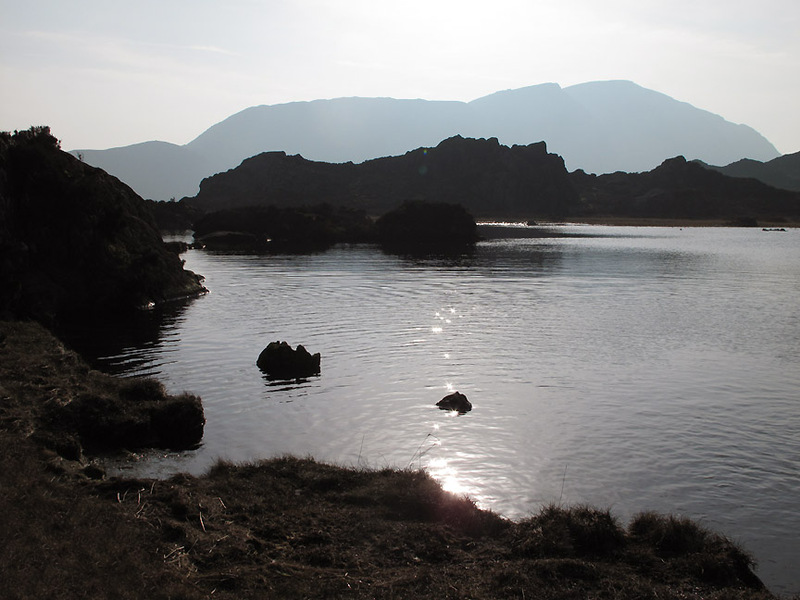 " Haystacks and Innominate Tarn "
Date & start time: 22nd March 2012 1.50 pm start. 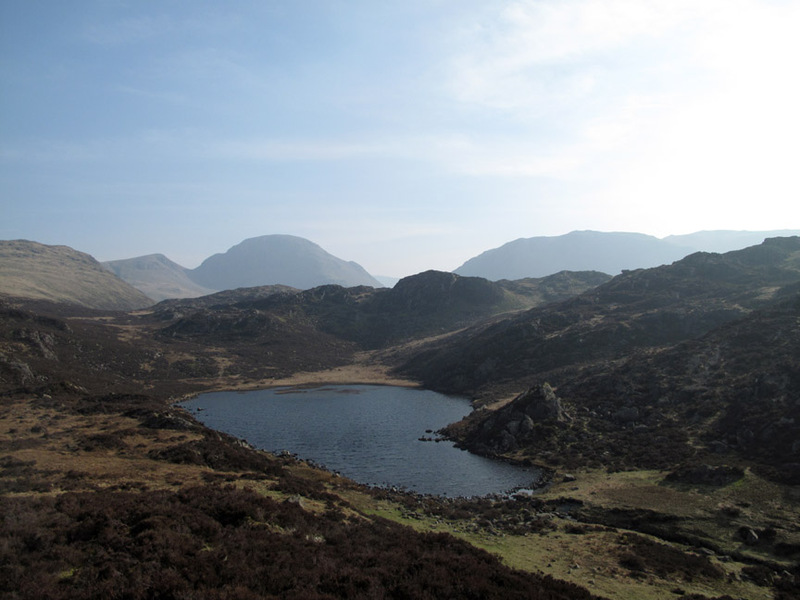 Places visited : The Dram Road, Dubs Quarry, Black Beck Tarn, Innominate Tarn, Haystacks and return. 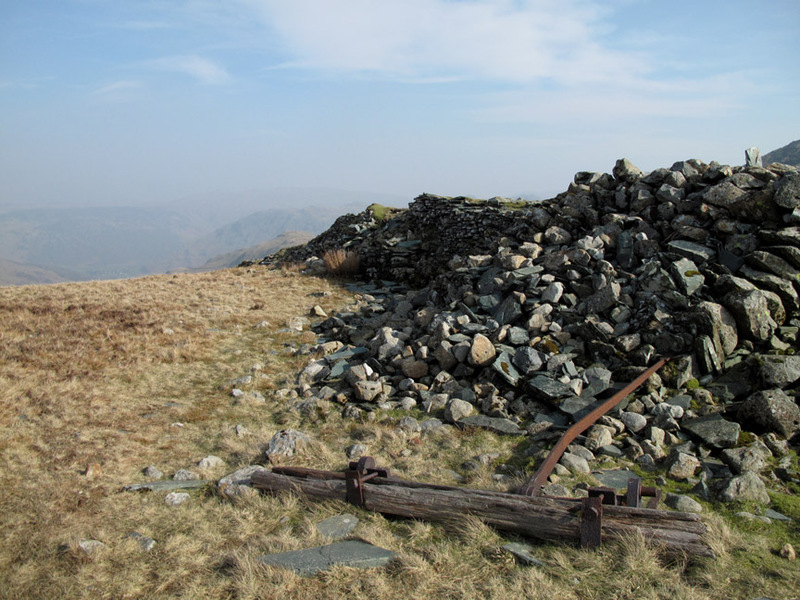 Walk details : 4.75 mls, 1575 ft of ascent, 3 hrs 20 mins. 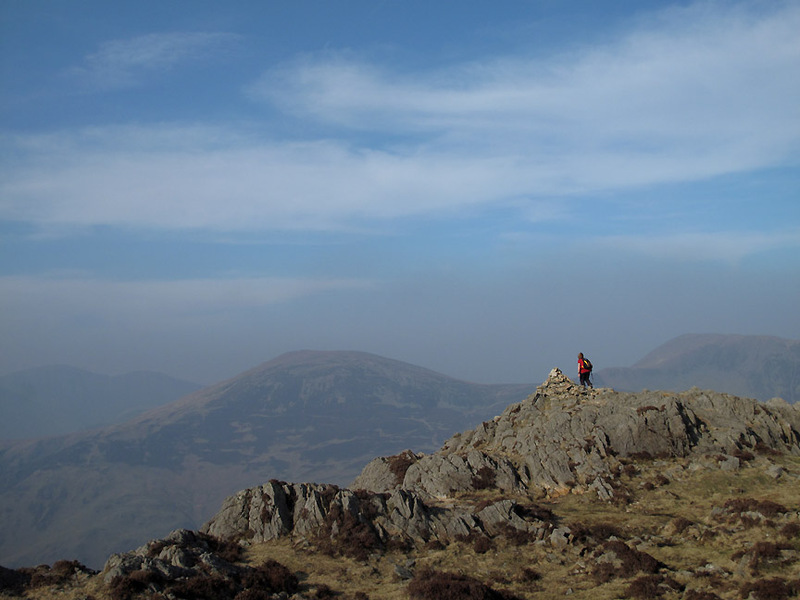 Highest point : Haystacks 1958 ft - 597 m.
Weather : Fine, dry, sunny but with a strong haze in the air. 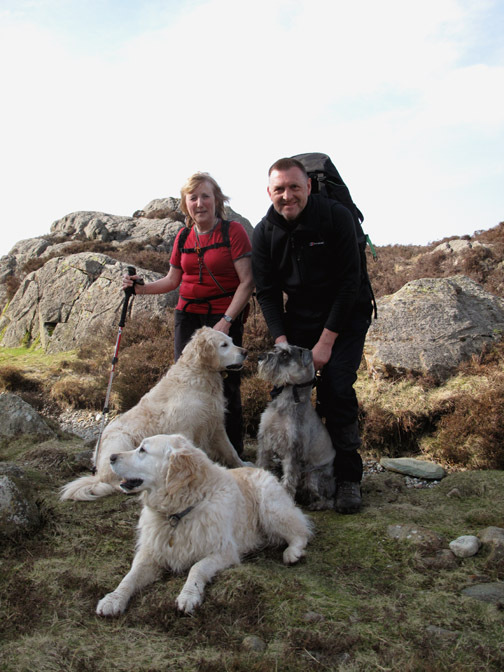 A free half-day so we had an early lunch and collected our smaller rucksacks for an extended afternoon walk. 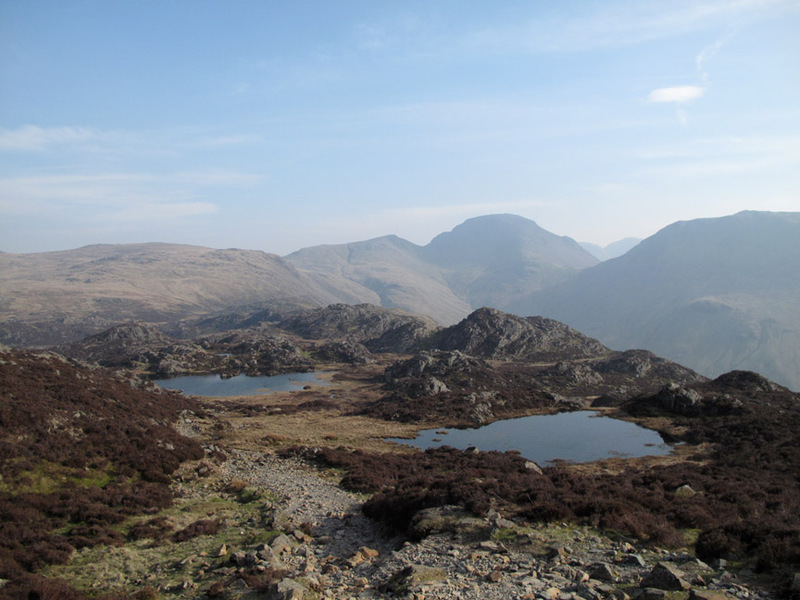 Three hours twenty saw us out and back to Haystacks and home in time for meal and a theatrical outing to the Village Hall. The clue to our start is in the writing . 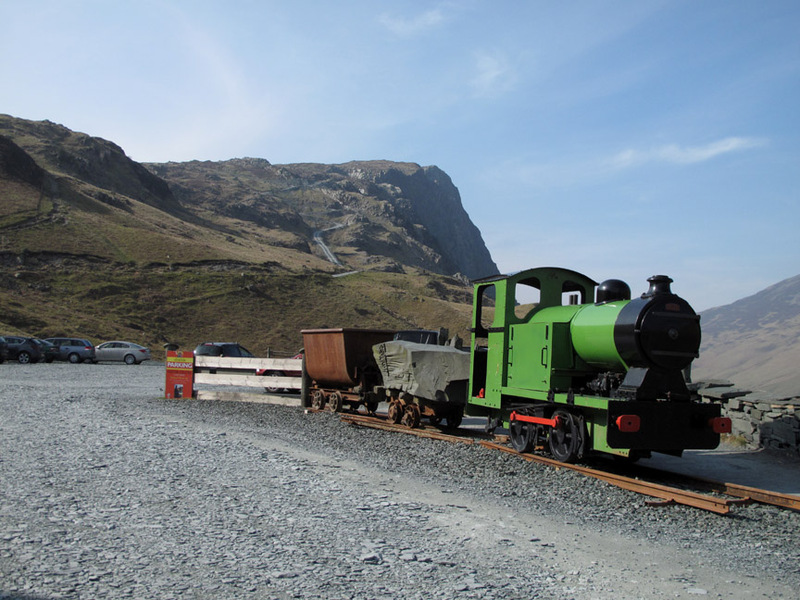 . .
Honister has moved their little train to a nicer position on the edge of the car park. We'll take the old tramway up and over to Dubs Quarry but this engine never worked the route . . . It was a rope hauled funicular track but probably used trucks not unlike the ones here. 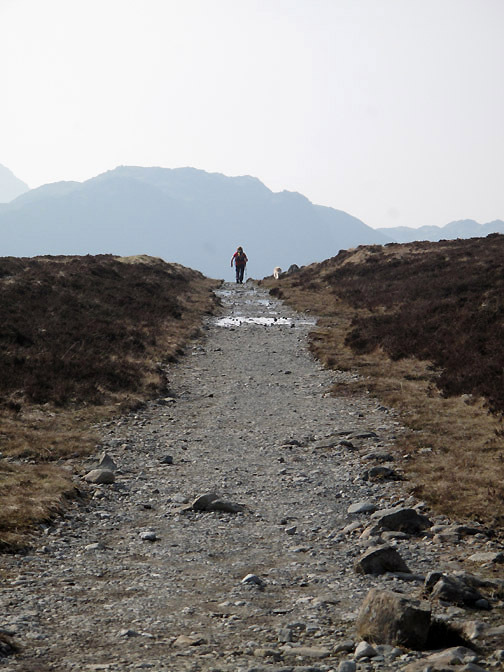 We ascended the path which quickly climbed up the fell side. 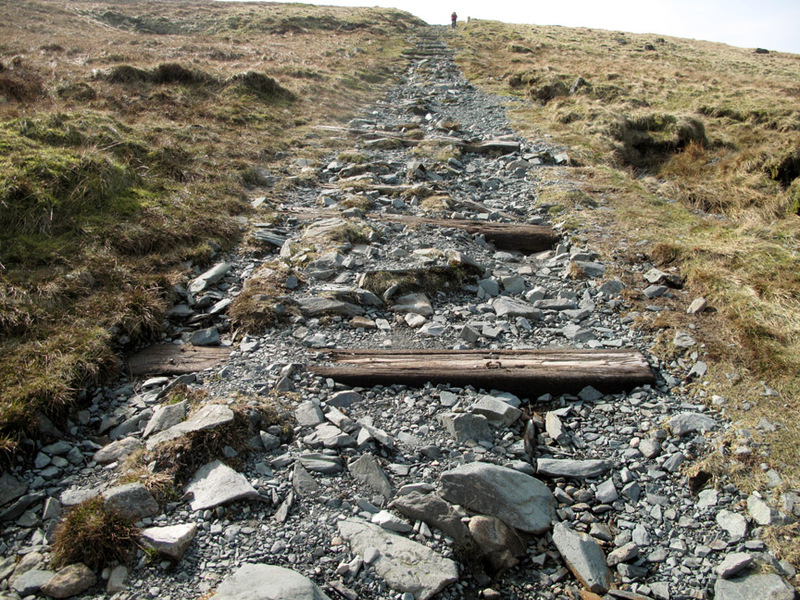 The path avoids the steep direct route that the dram road took when it was in action hauling slate. 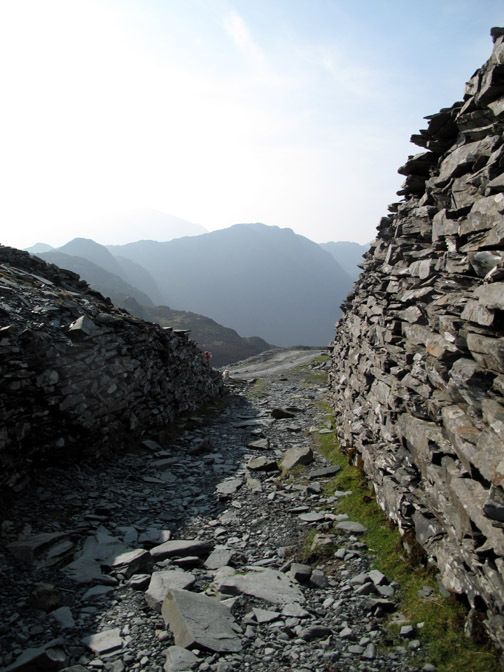 We join the old track bed higher up and climb steadily to the Drum House at the top. 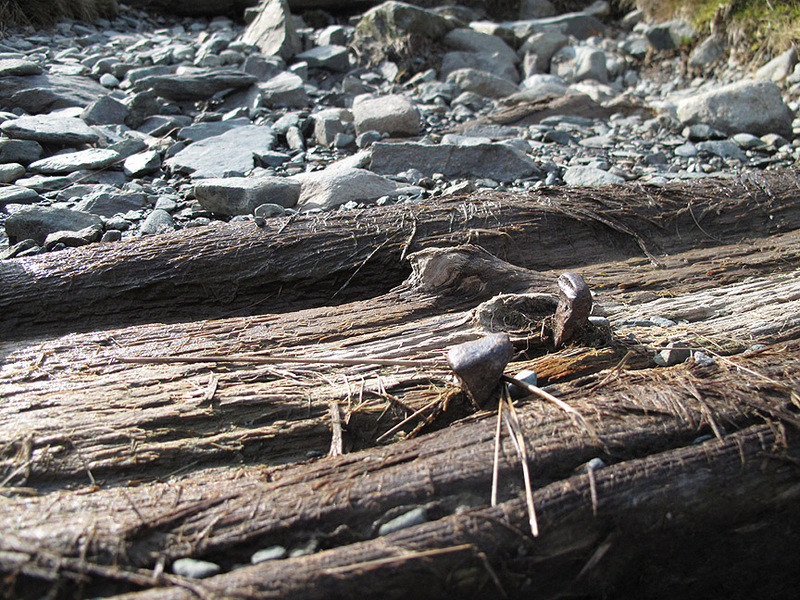 There is still evidence of wooden sleepers (circa 1891) in places. I'm not sure what made me notice them this time . . .
but some of the steel nails for holding the old rails are still in place. At the summit of the track, the old drum brake lever has been cast aside and lies rotting away. 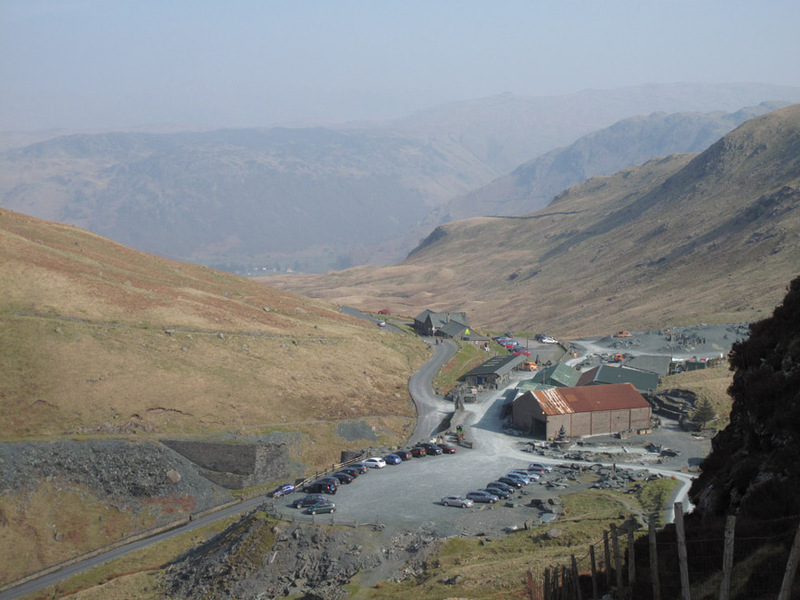 A little more history of the workings generally can be found on the Honister.com site. 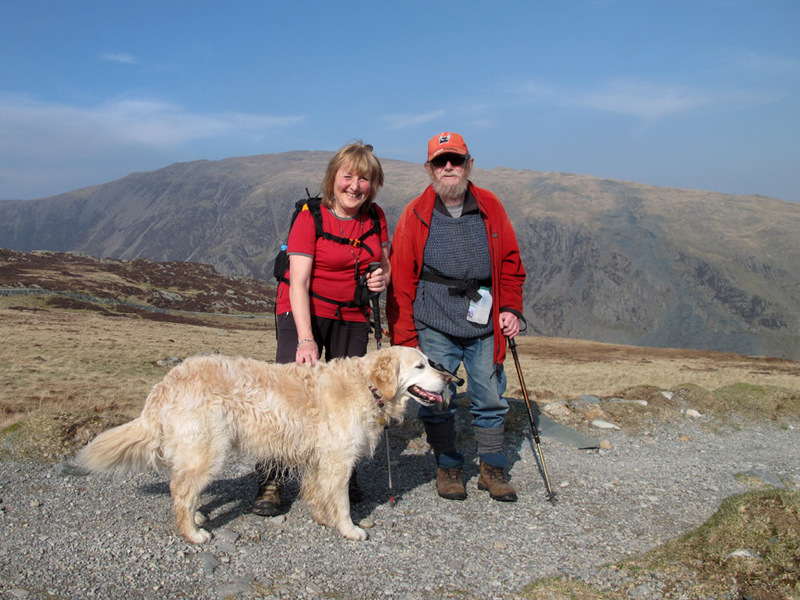 Last Sunday on Whiteless Pike we met this gentleman and exchanged a few pleasantries. We met Peter again today and just had to stop for a longer chat and a photo . . . good to meet you Peter. The old track continues straight over the fell side . . .
. . . and down into the Dubs Quarry workings. 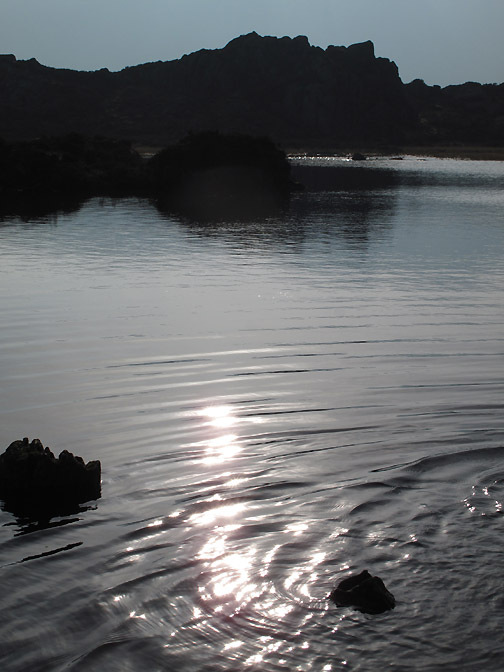 This was predominately an open slate quarry. 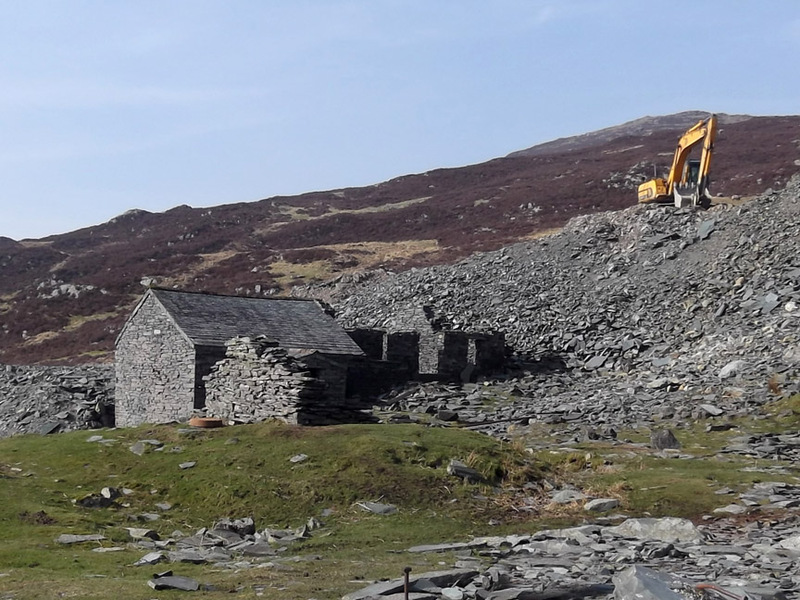 An old quarry building is now available to use as a mountain bothy. 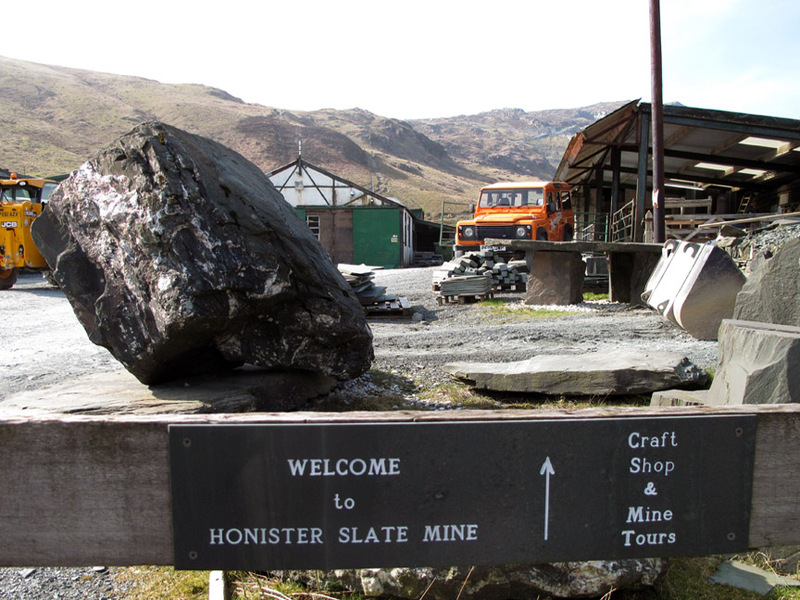 The Honister Mine folk are had at work recovering the old slate tip for chipping and subsequent sale. 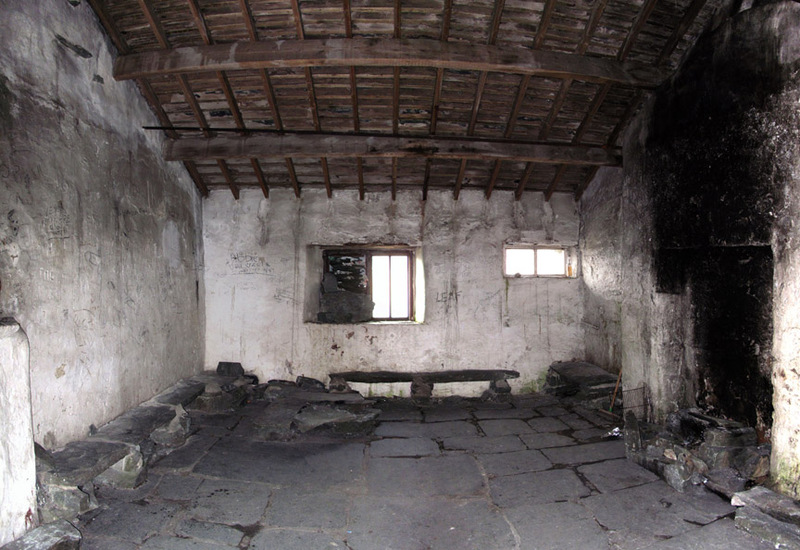 The entrance door is just visible behind the old wall in the foreground. Inside is looking a little worse for wear but is still usable . . .
despite the glass missing from two windows. These have been temporarily weather protected with slate and plastic. The views today were much hazier than Sunday. 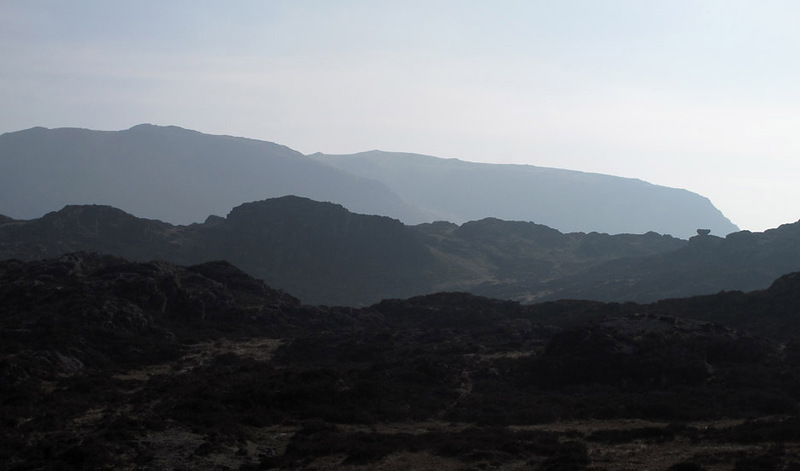 This is the view down from the Green Crag area . 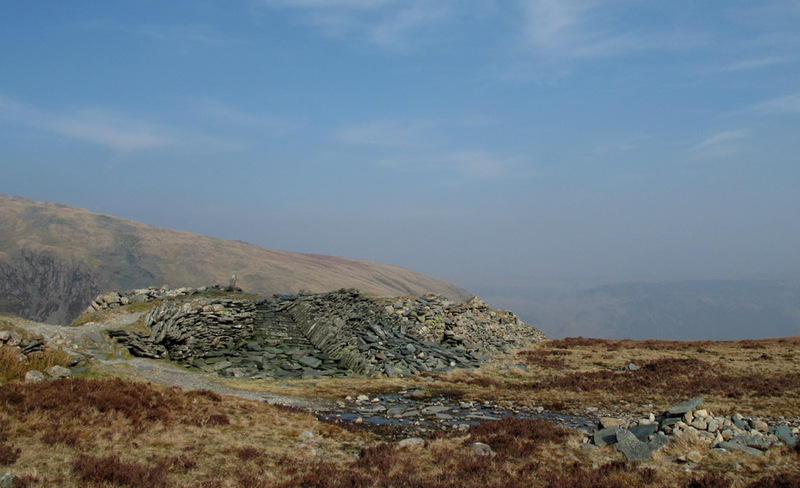 . . Mellbreak and Low Fell are hardly visible in the gloom. by Barry Hutchinson and his dog Freddy. Barry wrote to me recently on the topic of the Gasgale Gill bridges. under the heading " Local Rambles"
you seem to enjoy our reports. What's the old expression . . . If it is bad tell us . . . If it is good . . . tell your friends ! 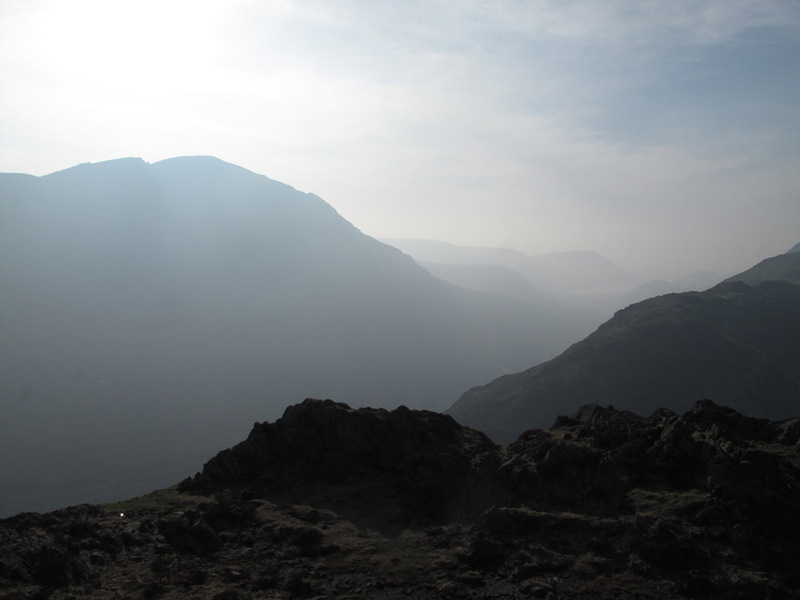 Walking on we enjoy the light and shade that strong sunlight and the haze brings to the fells. Note the perched boulder away to the right, sitting on a high rock slab. 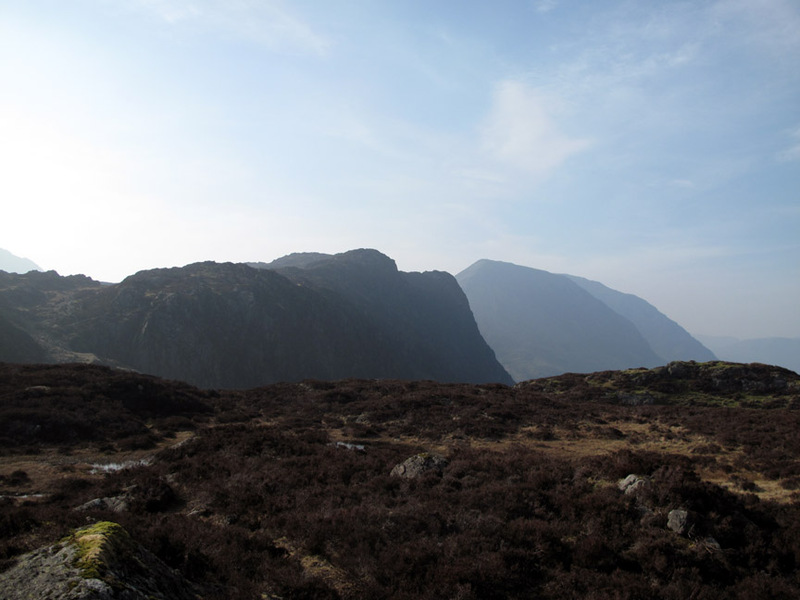 Ahead the shades of colour lead the eye up to Haystacks and beyond to the High Crag / High Stile ridge. 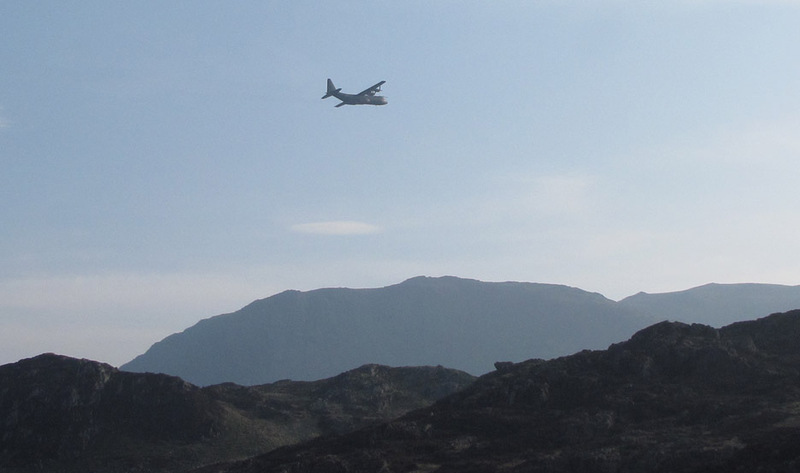 A slow rumble as a Hercules transport plane crosses the skies above Black Beck. We were to see him a couple more times before we finished the walk. 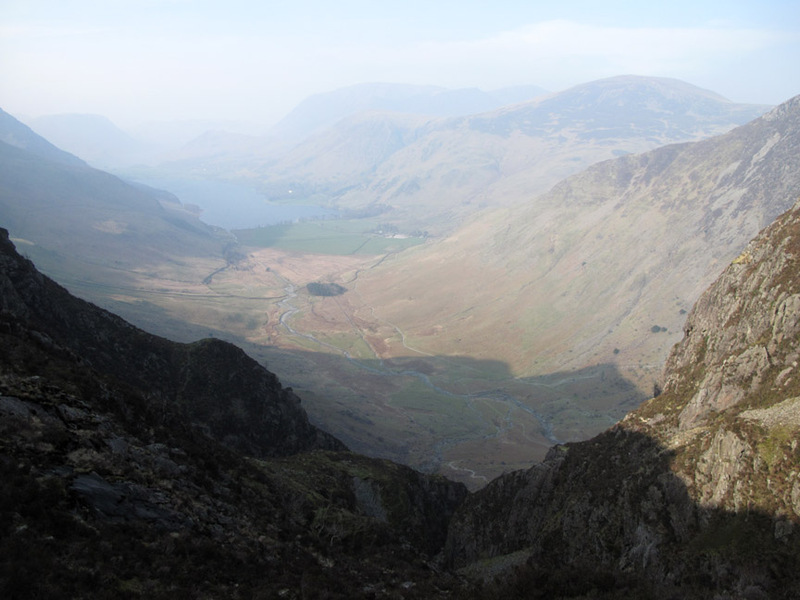 Looking down into Warnscale Bottom and Buttermere . . . the haze is not clearing at all. I know it's a warm afternoon . . . but I wouldn't go for a swim today ! Harry was loving it . . . and waiting for a stick to be thrown. Big problem . . . no trees . . . so no sticks up here. That's Bethan up ahead . . . saying hello to one of many groups of folk that we met today. 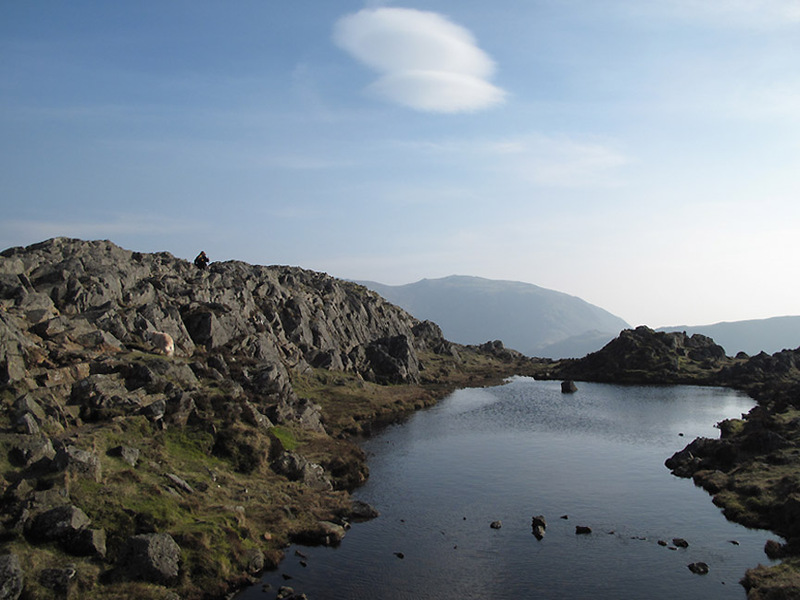 Great Gable over Innominate Tarn . 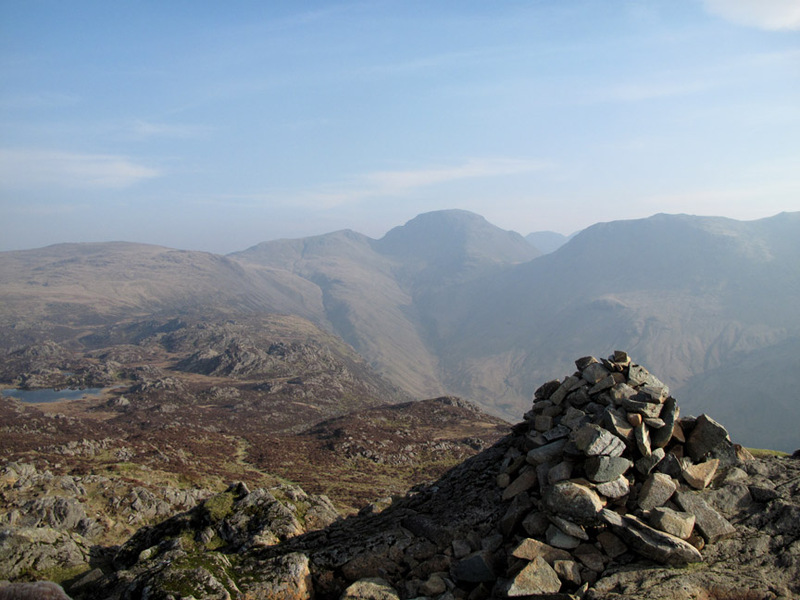 . . with Scafell Pike in the background. 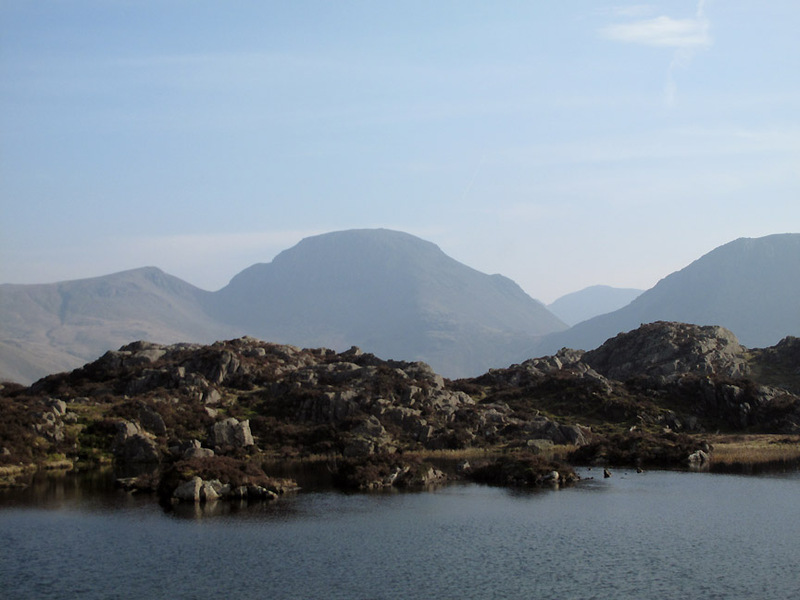 at the undulating top and often water-filled hollows of Haystacks. Ann makes a bee-line to the first of three summit cairns. Bethan stands by the second . . .
. . . where there is a potentially good view of Ennerdale and Pillar Rock. 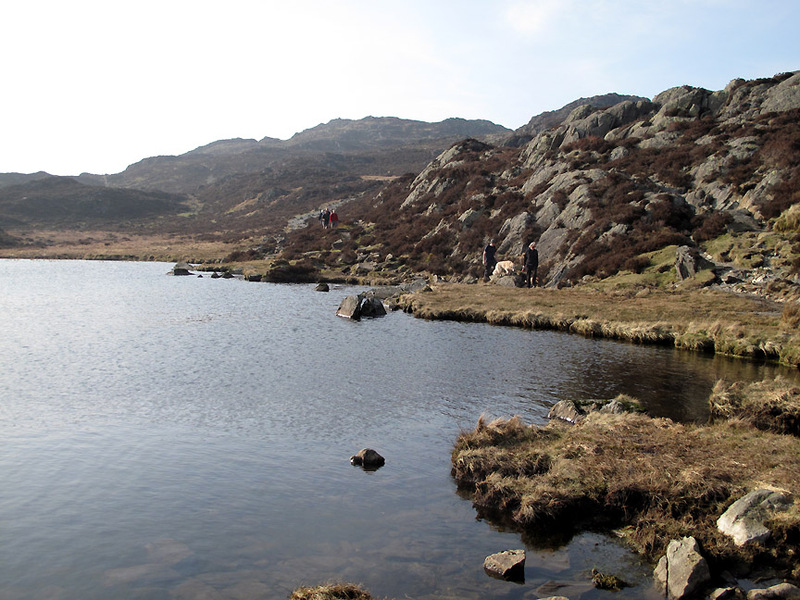 The summit tarn . 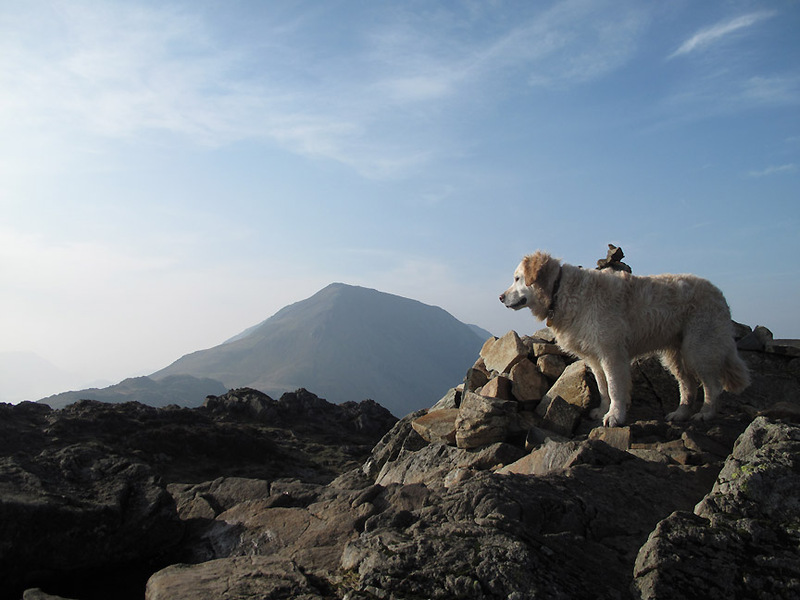 . .
as Ann makes her way to the third and highest cairn. 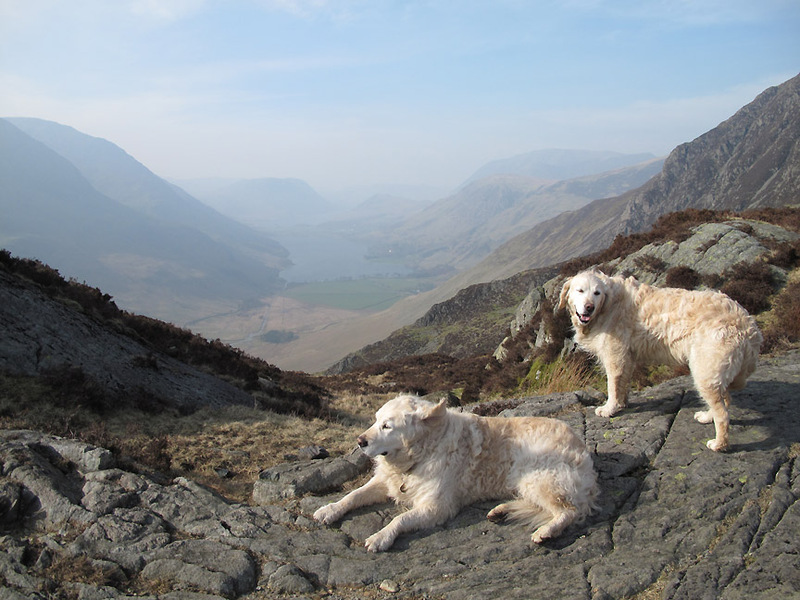 You certainly get the best view of the head of Ennerdale from here. 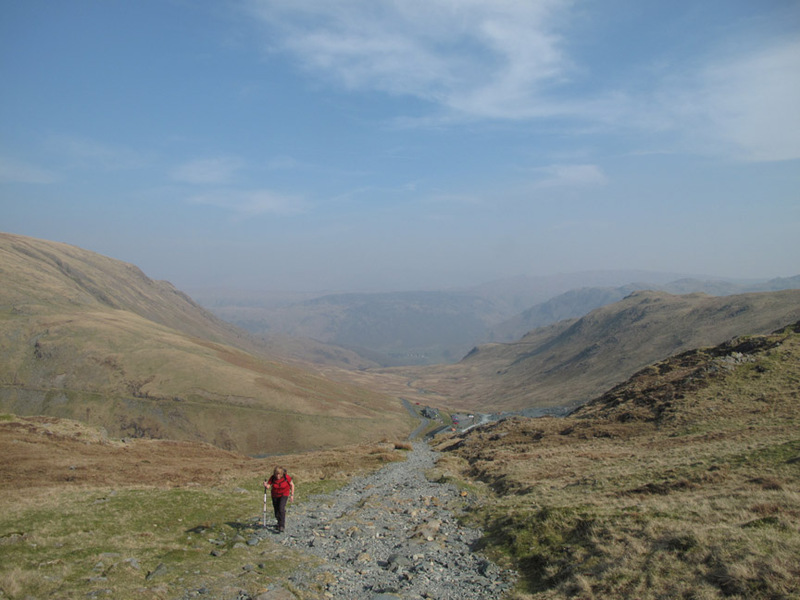 Time to be heading back to Honister. 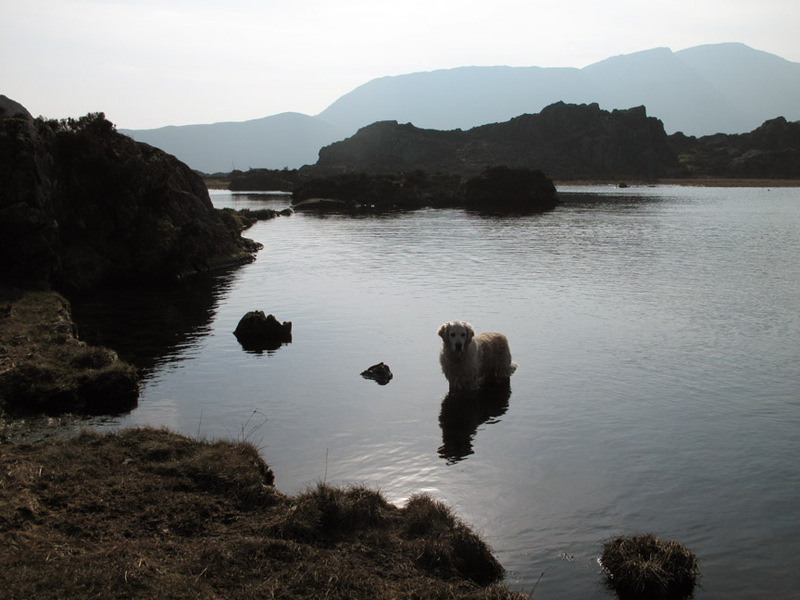 Innominate Tarn again as we retrace our steps. to dwell on the rest of your day. Technical note: Pictures taken with either Ann's Fuji Finepix Compact or my Canon G10/1100D camera. This site best viewed with . . . a little more time to sit and enjoy the atmosphere.